Recently, my husband and I were able to take a kid-free vacation. Not just any vacation. A dream vacation. One we had been planning for years. A couple things made this vacation exceptional. 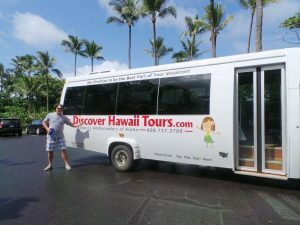 Not just the fact that it started in Hawaii, where we were able to visit with one of our newest accounts, Discover Hawaii Tours. (Which, by the way, offers some amazing opportunities to see the island with real pros). The vacation ended with us spending some quality time with friends, drinking amazing wine in Napa Valley, and last but not least, it was my first vacation using Google Glass! To say the least, I was excited. We were well prepared and, as usual, my husband did his research and put together an itinerary for the Hawaii portion of our trip that was well-thought-out. Throughout the trip and as we traveled through and around Maui, it became apparent that Google Glass was going to be a big part of our trip. It started the first day when we were walking past a restaurant and, lo and behold, a notice appeared on my Glasses giving me information about the restaurant. By the time I was done listening to the Zagat list of recommendations and to what people had to say, I was hooked! We just had to go to that restaurant, even if it was not on my husband’s list. Google Glasses directed us all over the island. Google Glass even shared with us what other Google Glass users were doing, along with their comments, pictures and videos. By the way, Cindy and Mark, your picture from your hotel room of the sunset on the first night of your honey moon was AWESOME! I was able to tweet and post to Facebook from my lounge chair without even moving. I was also able to answer emails, read the news and listen to my music while never leaving the beach or opening my Samsung Galaxy phone. Additionally, I was able to take pictures with a blink of the eye and, if I got bored, well, I was even able to play a game or two. I don’t even want to go into how amazing the Google Glasses can be in Wine Country. I’ll leave that to your imagination. But, my friends, I am here to tell you that this is how to take a vacation. This is why I love technology. As you know, technology has been making our lives easier and easier over the last few decades. Let’s take the telephone, for example, it’s gone from being plugged into the wall, to being carried around, to Bluetooth ear pieces, to a multi-functioning media kit with endless possibilities. Bringing the world of information from our computers to our finger tips was life-changing. How about bringing that information from your finger tips to your eye line. Google Glass provides this user-friendly functionality, and it’s not limited to the workplace. Apps have been designed specifically for those who love to travel. Whether you are travelling to an unknown destination in a faraway land or visiting a neighboring city you have never been to, Google Glass has the capabilities to make your time there easier and more enjoyable, making sure you get the most out of your travels. One of the really cool features of Google Glass that we loved is the app Field Trip. It basically provides you with your very own personal tour guide while you are out exploring a new destination. Google has chosen over one hundred local publishing partners to source the information from, including cultural repositories, Zagat guides and local blogs. The app will identify landmarks and tell you the history behind them. It also offers insider tips and helps you to locate those hidden gems that can make your trip extra special. As you’re walking through a city and you see an old church, an interesting looking statue or a historical landmark, Field Trip will fill you in on all you need to know about it. This means you don’t have to spend time digging out your guidebook, flipping through pages and hoping the information you want is in there somewhere. The necessary information is displayed by Google Glass right in front of you, or you can opt to have it read out from the tiny speaker behind your ear. Another exciting app for Google Glass is Google Now. Pulling information from your Gmail, recent locations and your google search history, it can give you up to date information for things happening in your current location. Producing cards, it will display information regarding nearby shows, movie times, restaurant chains, the weather and more. The major feature of this app that will appeal to most travelers is the flight card. Any reservation for flights or hotels you receive to your Gmail account will generate automatic notifications to remind you of your booking. What’s more, is it will keep you informed of any delays or other changes to your flight itinerary. In fact, it will even provide details on routes to the gate. There’s no excuse for ever missing a flight again. From a travelers perspective, Google Glass is an incredibly versatile, time-saving tool. The excitement surrounding apps such as Google Now and Field Trip is understandable but the more mundane aspects of travel have not been forgotten. Getting around has never been easier. The Navigation app provides you with step by step directions for you to get to where you’re going. Using maps to guide you, it even cuts the display until a turn is about to come up, allowing you to take in your new surroundings, uninterrupted. Google has two great apps for translation purposes. First is the Word Lens apps, which allows the user to translate any printed word into a language of their choice. There will never be a restaurant menu or road sign you won’t be able to understand again. Second is the voice activated translation service, where you can just say those magic words, “OK Glass,” and translate what you want to say into the local language. Voice searching, offline email, hands-free photo and video taking, as well as voice controlled social media sharing, are all features that travelers will enjoy. And, of course, keeping in touch with home was never easier with voice and video calls direct from your Google Glass hardware. Google Glass gives travelers seemingly endless possibilities. The tools are there to make your experience on the road more enjoyable and more fulfilling than ever. You can be sure that Google has plenty more travel orientated ideas in the pipeline for Google Glass users in the not too distant future so watch this space! My advice? If you travel for business or pleasure, if you love technology, if you just want to stay social and a head of the game, then invest in a pair of Google Glasses. You will not be sorry.